Many are saying that the world has changed and that it changed on November the 8th with the election of Mr. Trump as our next president. Some are excited and hopeful about this change. They’ve waited a long time for this day. Others are terrified and dismayed about the change. They never wanted to see this day come. Both sides have expressed anger. Most, I suspect, are just worn out by the whole process. And everyone seems to be looking to and trying to predict the future. What will happen? What new policies and legislation will be enacted? What existing policies and legislation will be repealed? Where is America headed? What does the future hold? Those questions are not just for post-election America. The disciples surely must have thought their world would be changing when Jesus told them the temple would fall, not one stone being left upon another (Matthew 24:1-2). The very center and structure of the Jewish society was changing. Their feelings and questions probably were not a whole lot different from ours. People in every time and every place have asked and struggled with questions about the future. How do we live with an unknown and uncertain future? What do we do when it looks like “all will be thrown down” (Matthew 24:2)? These are Advent kind of questions and today, the First Sunday of Advent, always puts us in the tension of a world that seems to be changing, a future that is not predictable, and the promise of divine presence. The Season of Advent is upon us, not just for the Church but also for America. As I have reflected on the election in light of Advent I’ve begun to think that maybe the world hasn’t really changed. What if the world hasn’t changed but we woke up to see the truth of what’s happening and who we’ve become? What if this election was simply America’s wake up call? What if everything about our country and the world today, the election, and the campaigns leading up to the election were begging us to wake up and see what is already before us? To wake up and see that all human life is sacred and fragile. These things did not suddenly appear for the first time on November 9th. The world did not change. We woke up. We awoke in a new way to the reality that was already before us. You might be thinking to yourself, “Now you’re getting into politics. What you listed are political statements and issues.” Yes, they are. That’s not, however, a reason to not talk about them. I’m not laying blame or taking sides. I’m naming what is happening in our country and asking if we are really willing to say that the Word of God has nothing to say about our politics, that the gospel of Christ is irrelevant. Despite what has become of our political system and the ways it has been manipulated and perverted, politics is intended to be about how we live together, and Jesus has a few things to say about that. Jesus has a politics. He is not partisan but he is political. 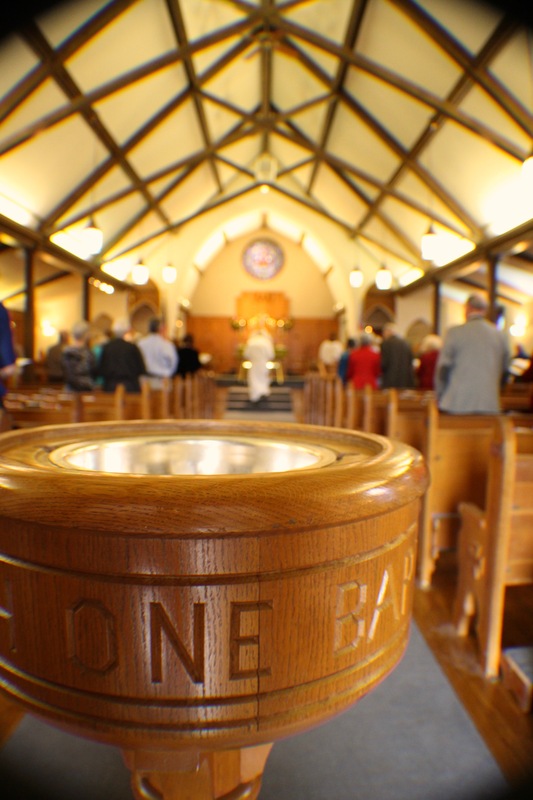 Just three weeks ago we celebrated the Feast of All Saints and we renewed our baptismal vows. We made promises. We made political promises. We promised to respect the dignity of every human being. We promised. So how’s that working? What do those promises mean for post-election America? Do they mean anything? Our baptismal waters may have dried but our promises remain. This election and everything leading up to it has set before us a context for our baptismal work. This is the unexpected hour. Now is the moment for us to wake from sleep (Romans 13:11). Reclaiming our baptism may just be the most important work we can do right now. It is our work for America, for one another, for Christ. Mr. Trump and the Republicans will make proposals for dealing with our country and the world. The Democrats will also make proposals. Others will post on Facebook and forward e-mails. Opinions will be expressed and positions will be promoted. What about you and me? What will we do? Let’s not exchange our baptismal promises for the partisan proposals of either side. I don’t want to do that. I don’t want this parish do that. I don’t want you to do that. We cannot continue to sleepwalk our way through life. The things I listed are not just issues to be solved, agendas to be pursued, or problems to be fixed. They are people, lives that are fragile and sacred, just as fragile and just as sacred as your life and my life. So what if we saw them, one another, and ourselves through the lens of our baptism? What if we let our baptismal vows guide our actions, determine our words, and establish our priorities? What would that mean for us? What would it call forth from us? What would it demand of us? What might we need to change? What would we need to let go of or give up? How would we do life and politics differently? What would it take for us to fulfill our baptismal promises in today’s circumstances? I don’t know what will happen in the next four years. I don’t think anyone knows. The future is unknown and uncertain. It always is. I can’t tell you what the future will bring. But I know this. We must not live in a future we do not yet have. And we must not make up our future based on the loudest and angriest voices, the fear mongers, the predictions of doom, or stuff that’s just not true. This moment, this hour, this day is the only one in which we have some potential for clarity, some opportunity to make a change, some ability to do things differently. We face the uncertainty and the unknowability of our future by living faithfully in the present. That means we must remain vigilant. We must stay awake and be watchful. We must first be watchful of what is going on inside of us; our thoughts, fears, anger, the emotions that overtake us, the choices we make, the words we speak, the actions we take. Do they align with our baptismal vows? Are they congruent with the life of Christ? Do they show us to be followers of Jesus or partisan proponents? We must also be watchful for the divine presence in the other; the divine presence in our neighbor, in the stranger, in the foreigner, in our enemy; the divine presence in those who think and act differently from us; the divine presence in Republicans, Democrats, Independents, protesters, and non-participants; the divine presence in those who do not worship or believe as we do; the divine presence in the poor, the hungry, the homeless, the refugee, the marginalized, the oppressed; the divine presence in those whose choices and lifestyles are not our own; the divine presence in humanity. The very unexpectedness of the divine presence coming in another human being, especially one who is different from us, demands that we be awake and watchful, because if we are not we will surely miss it. We must always be ready to recognize and respond to the divine presence in the unexpected hour. That readiness means we must “lay aside the works of darkness” and “put on the armor of light” (Romans 13:12). It means beating our “swords into ploughshares” and our “spears into pruning-hooks” (Isaiah 2:4). It means trading our words and acts of violence for words and actions that grow, sustain, and nourish life. It means returning to the waters of our baptism. To be awake, watchful, and ready, make room for something wholly unexpected and transcendent to interrupt our lives and forever change our destiny and that of the world. “But about that day and hour no one knows” (Matthew 24:36). So what if we lived every hour of every day as the unexpected hour, trusting that wherever our baptismal life intersects the life of another the promises of Advent are fulfilled and the Christ is present? It may just be that post-election America is the most unexpected hour of the coming of the Son of Man. Let’s not sleep through it. Carmen, thank you for your generous and encouraging words. I am glad you found the sermon inspiring and I hope it is helpful to your group’s reflection and prayer. Thank you for your love and prayers. I am grateful. I think of you often and you remain in my love and prayers. God willing, we will soon see each other again at Lebh Shomea. Mike, from all my times and places, I have almost never heard a more cogent and inspiring sermon than we heard last Sunday! May we all reflect on your words deeply. Thank you Robert. I do appreciate your encouraging words. It was so nice to see you and your family and I look forward to the next time you all are in town.